I’ve always found wigs to be the hardest piece of a cosplay to put together, especially when you’re dealing with funky hairlines or multiple colors of hair. I cosplayed Tohru from Miss Kobayashi’s Dragon Maid at the last con I attended (Kumoricon), and I really wish I had put more thought into the wig I chose. I bought her wig from Amazon for around $30; it was decent considering the price, but I wasn’t 100% satisfied. I’ve decided to change up how I go about putting together a cosplay going forward. In the past, I’ve always created a costume with a specific con in mind, and set the date I needed it completed by hinging on the first day of con. I’m throwing that mindset out the window, and even though it’s the dead of winter and the next con I want to attend isn’t until mid-spring, I’m going to make decisions now so that I can put the proper time into each piece. 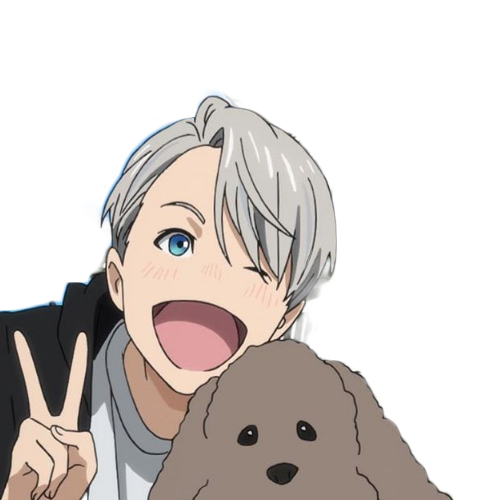 I have a talent for falling in love with characters with strange hair parts like Victor from Yuri On Ice above, and unless you buy a wig that was manufactured with a specific character in mind, it’s a huge pain in the neck to style a regular wig to have a part down to the hairline. The other day while researching cosplay wigs, I ran across a type of wig I had never seen before, they’re called U-Part Wigs and the wig actually has a U shaped space where you can incorporate your own hair to create a more natural look. They’re in a higher price range than a typical wig, but I’m thinking they would be really useful for those tricky hairlines. This wig is from Addcolo, they manufacture their wigs in-house and offer a ton of personalized options. For example on this blonde wig, you can specify the hair length, choose a left, right, or middle location for the U-Part, and even choose the hair strand density which is awesome for those really floofy characters like Sakura (Naruto) below. You can also choose your cap size which I love, finding the right size cap is an on-going battle for me since every brand has their own strange sizing. You can also specify the depth of the part, so for instance, if you were going for Nana you would want a very short opening for her style. If you’ve never worn a U-Part (like me), here’s a handy video showing how they work, I found it pretty useful. I’d love to hear if anyone has worn or heard of this style before, drop me a comment! Next story Clean & Dry Makeup Brushes in 20 Seconds Flat? !